...three if you're being technical! Thankfully, I'm only discussing two today. But first, the winner! Congratulations to Holly of Silver Rose Designs! Carry your "Make Coffee Not War" bag proudly, Holly. First, I've added a fun link to this blog. It's just over to your right with the other links. 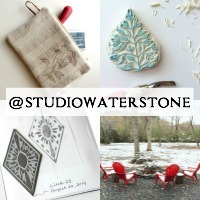 This is my Studio Waterstone Amazon Store! I get to show you what I use inside and outside of the studio. Let's face it, everyone likes to see your tools. I'll continue to add and change up things that I highly recommend. Let me know what you think. The other shop? That would be Studio Stoop Sale. Yes, it's been a bit measly since it's birth. I'm hoping to organize and list quite a few things this week including what I'm calling "sample handbags" - handbags I've gently used and tried out myself. I'll also include (cough) a few handbags from my pre-handbag-making past and other goodies. So watch for that. Follow if you like. I'll be sure to post here once things are added. Wednesday's Earth Shattering, Life or Death Kind of Questions promises to be nail biter. And, of course, we'll wrap up the week with my online journal. Please feel free to contribute and link up with your weekly busy-ness. Having said all this (and it's a mouthful), I wish you a fantabulous week, my friends! Congrats Holly! aaahhhh, the luxury of carrying a bag someone ELSE made!! especially from Lori's beautiful collection! Lucky girl! Heee, I'm so excited! Thanks so much Lori!